Pay TV companies in the United States posted their worst ever quarterly video subscriber losses in the second quarter, “validating industry cord-cutting fears,” according to IHS. 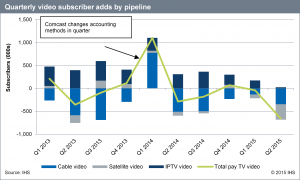 The research firm claims that the pay TV companies shed a total of 658,450 subscribers in Q2, marking the first time that non-cable operators have lost video subscribers since satellite operators entered the US pay TV business in the early 1990s. 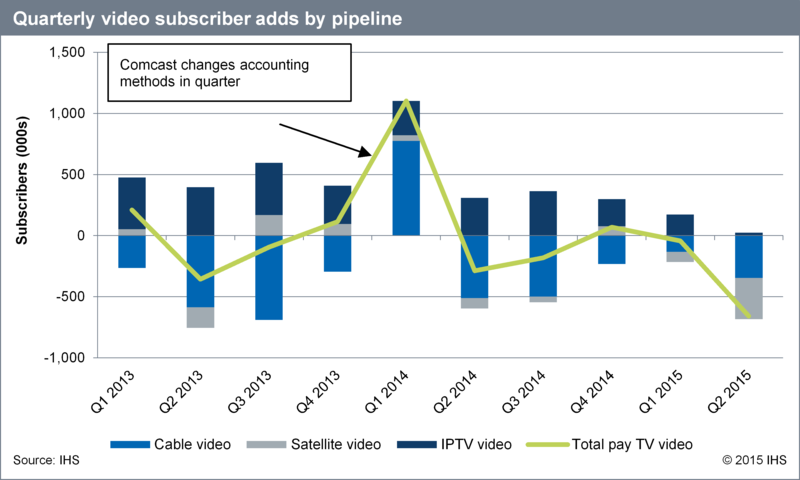 According to IHS’s ‘State of the US Pay TV Operator Market’ report, US satellite operators lost “significant numbers of video subscribers” in Q2, with Dish losing an estimated 285,000 total subscribers and DirecTV 133,000. AT&T U-verse TV also experienced its first quarterly loss in Q2, with the company now claiming to be focused mainly on high-value subscribers, according to IHS. “Until the fourth quarter of 2014, IPTV had been the only pay TV category to experience growth; however, by Q2 of this year, IPTV’s significant forward momentum had been lost,” said Erik Brannon, principal analyst of television media for IHS Technology. However, cable operators showed a “very slight improvement in Q2 2015 over Q2 2014” as the bundling of faster-than-IPTV broadband and video gave cable TV companies a small local advantage over IPTV. “In much the same way that cable companies had to make room for satellite and IPTV operators, the maturity of IPTV is a signal that US pay TV companies must now strike a balance with over-the-top TV offerings,” said Brannon.